For a short and popular text, the Heart Sutra is poorly understood (or widely misunderstood) and poorly studied. A lot of basic research on the Heart Sutra has been left undone, presumably because it is hard to get funding for this kind of thing. However, over recent years, Jan Nattier, Matt Orsborn (aka Huifeng), and I have all contributed to a reassessment of the basic text in Chinese and Sanskrit and the relations between the two. I'm hoping to publish the last of the necessary corrections in 2018, though this will leave a number of aesthetic issues and "would-be-nice" corrections to be made. Had I been in academia, the series of articles I've published since 2015 would have been my PhD thesis. Hopefully it will be a book soon. There are several different kinds of error in the Heart Sutra. In this essay, I review the types of error that I have encountered while studying the sutra and give examples of each. There is a spectrum from errors that are matters of aesthetics to those which render passages unintelligible. And all this in a text of barely 250 words, just imagine what state the rest of the Buddhist Canon is in. These are only relevant for people who read manuscripts (and I may be the only person doing this currently for the Heart Sutra). 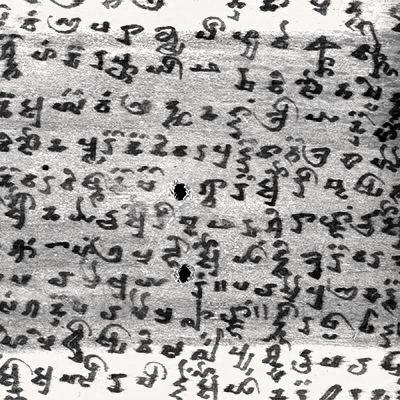 Some may recall that in 2015 I identified a previously undescribed Heart Sutra manuscript in a newly digitised cache from Nepal. Transcribing and editing it required 142 footnotes to describe all the errors, most of which were simply due to being copied by generations of careless scribes who did not know Sanskrit. To give credit where it is due, Conze (1948, 1967) fixed a huge number of scribal errors found in the dozen or so manuscripts he used for his critical edition. Müller (1884) fixed some of the errors in his diplomatic edition of Hōryū-ji manuscript, though ironically many Japanese seem to prefer the uncorrected version. CBETA, the electronic version of the Taishō edition of the Chinese Tripitaka, is notorious for its punctuation errors. There's only one big problem in the Heart Sutra, which is between the boundary of section V and VI (Huifeng 2014). This one is understandable, since 亦無得 marks the end of the quote from T223, but Huifeng (2014) showed that 以無所得故 is, in fact, intended to go with section V. This makes quite a big difference to how we read this section and is key to understanding the meaning of the quoted section. It was also mistranslated into Sanskrit, and this may have been the source of the punctuation errors. I will deal with the Sanskrit errors and how to translate this passage under heading 4. Conze also tacitly changed the Buddhist Sanskrit spellings, which are entirely regular across Mahāyāna manuscripts, to classical Sanskrit spellings that are not used by Buddhists: āryya → ārya; and bodhisatva → bodhisattva. II. Āryyāvalokiteśvaro bodhisatvo gambhīrāṃ prajñāpāramitācaryāṃ caramāṇo vyavalokayati sma pañcaskandhāṃs tāṃś ca svabhāvaśūnyān paśyati sma. VI. Tasmāt śāriputra aprāptitvād bodhisattvo prajñāpāramitām āśritya viharaty acittāvaraṇaḥ. Cittāvaraṇa-nāstitvād atrasto viparyāsa-atikrānto nishṭhā-nirvāṇa-prāptaḥ. VI. Tasmāt śāriputra aprāptitvād bodhisattvo prajñāpāramitām āśritya viharaty acittāvaraṇaḥ cittāvaraṇa-nāstitvād atrasto viparyāsa-atikrānto nishṭhā-nirvāṇa-prāptaḥ. However, even with the errors corrected, this is a bad translation. I show why in the next section. Here, we are not speaking of the many paraphrases found in the quoted sections of the Sanskrit Pañcaviṃśati-prajñāpāramitā-sūtra that occur because of translating back and forth between Sanskrit and Chinese. These are actual mistakes. In Section V aprāptitvād translates 以無所得故, but Huifeng (2014) showed that it should have been anulambhayogena, "engaged in non-apprehension [of dharmas]." It was confusing because in the previous word the character 得 is used to mean prāptiḥ. And note that since 以無所得故 is not part of the quote, it was the choice of the Chinese author of the Heart Sutra. That said, this usage is in line with the idioms used by Kumārajīva. Early commentaries by Kuījī and Woncheuk suggest that this passage was misread by the end of the 7th Century. This changes the whole tenor of the quoted passage. Now it reads "In emptiness, by practising non-apprehension of dharmas, there is no form, sensation, recognition, volition, or cognition". In other words emptiness is not an entity or a quality, it is a state. In that state, attained by practising non-apprehension of dharmas, the experiential world ceases for the meditator. In other words this is an epistemology of deep samādhi rather than an every day ontology. No one is saying that form doesn't exist, they are saying that when someone is not-apprehending form, then for them there is no experience of form. And this changes everything. Section VI required a major rewrite in two steps. Corrections to Conze's errors are above. Below is the fully corrected Sanskrit incorporating insights from Huifeng (2014), the argument for which will be in Attwood (forthcoming 2018c). The mind of the bodhisatva who relies on perfect gnosis is not attached anywhere; being unattached, [the bodhisatva] is unafraid and goes beyond delusions and illusions to the final extinction [of craving]. In Section III we see the addition of the phrase: yad rūpaṃ sā śūnyatā | yā śūnyatā tad rūpaṃ. As Nattier (1992) noted this passage has no parallel in any Chinese text, except those translated from a Sanskrit version with this addition. We can simply eliminate this line. Note that Kazuaki Tanahashi (2014) eliminates the wrong phrase, and leaves in this one, causing him to mismatch the remaining phrases in Chinese and Sanskrit. It seems that the "translator" could not, in fact, read Sanskrit, which would explain his many other errors in that language. It's as though some later editor confused the point of this part of the sūtra as being about mere negation and also did not recognise the nidānas as a set. Also, in Conze's text: na jñānam, na prāptir becomes na jñānam, na prāptir na-aprāptiḥ. Some of the manuscripts have this, so it is considered under this heading rather than as Conze's mistake, even though he did fail to correct it. There is a further problem here that comes under Heading no.8. Conze mistranslated vyalokayati sma as "looked down" when it means "examined". It's also a transitive verb and so requires an object; the subject has to be examining something, and in this case it is the skandhas. Most of the modern translations mistranslate śūnyatā in an effort to shoehorn their modern Zen ideology into the text. The word means "emptiness" or perhaps "absence". It does not mean "openness" or any of the other wishy-washy attempts to get ahead of readers misconceptions. The latter seems pointless. I've yet to meet any Buddhist that mistakes emptiness for non-existence precisely because it is drummed into them from the outset. 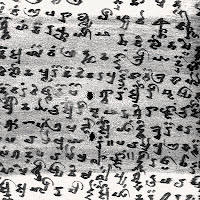 Kumārajīva incorrectly translated the end of Section V. All of the other text, Chinese and Sanskrit have na prāptir na-abhisamayo. For some reason Kumārajīva switched these two and chose an ambiguous translation for abhisamaya that ended up being mistaken for jñāna. Technically this is not a problem with the text, but a problem with those who interpret it. Between them, D. T. Suzuki and Conze thoroughly poisoned the well with Theosophy inspired mysticism. We are led to believe that the text does not make sense. Clearly, it does make sense, but only if one understands the context and can eliminate all the accumulated errors. I've included this because it gave rise to persistent errors and obscured many of the other kinds of errors from scholars who might otherwise have fixed the text decades ago. In this category we might also mention Thich Nhat Hahn's "correction" to the Heart Sutra, which I have already commented on previously. And those comments now attract a solid Vietnamese readership - some of whom wish to inform me that there are no mistakes in the Heart Sutra and that TNH never said there were, and some of whom seem to want to discredit TNH. Until the underlying text of the Heart Sutra is sorted out there is no point in continuing to translate it into English. Yet, no doubt, two or three erroneous translations will appear in 2018 to swell the bookshelves of Buddhist bibliophiles. It is likely that they will be produced by charismatic Buddhist "leaders". They may offer a "new translation" of the Sanskrit text, though chances are the translator is unlikely to know any Sanskrit apart from common jargon terms. Because the text is full of errors of all these kinds, we can say with confidence that all of the existing translations are wrong and need revising. The alarming truth is that those religious leaders who have translated it to date have been ignorant of most, if not all, of these errors. They have not read the text with an understanding of the context or even the language it is in. They pretend to understand the text because that is what is expected of them by their followers. The result is that, for some centuries now, the Heart Sutra has been on a procrustean bed in which all kinds of sectarian Buddhists have stretched it to fit their belief system, whatever that happens to be.